Any audio on your PC can now be heard throughout your house! Airfoil for Windows allows you to send any audio to AirPort Express units, Apple TVs, and even other Macs and PCs, all in sync! It's your audio - everywhere. With Airfoil you can take audio from any application and send to your AirPort Express units, as well as Apple TVs, and even other Macs and PCs running Airfoil Speakers! Transmit audio from RealPlayer, Windows Media Player, QuickTime Player, and other media players. Send audio from web-based applications like Pandora, Last.fm, and other to the AirPort Express. You can even stream audio from audio devices like RadioSHARK, XM and Sirius radios, around your house. 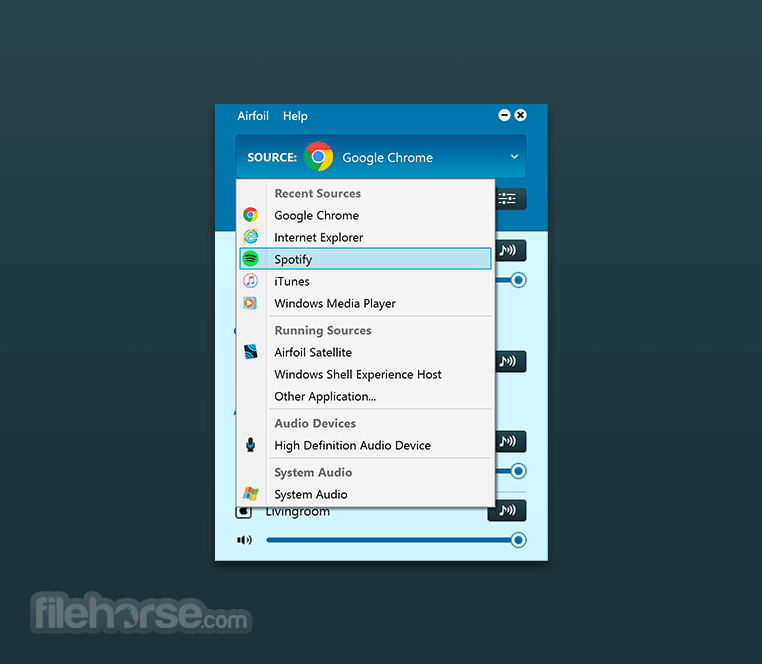 Stream any audio from your Desktop all around your network. Send music services like Spotify or web-based audio like Pandora wirelessly to all sorts of devices, including the Apple TV, Google Chromecast, and Bluetooth speakers. You can even send to iOS devices and other computers. 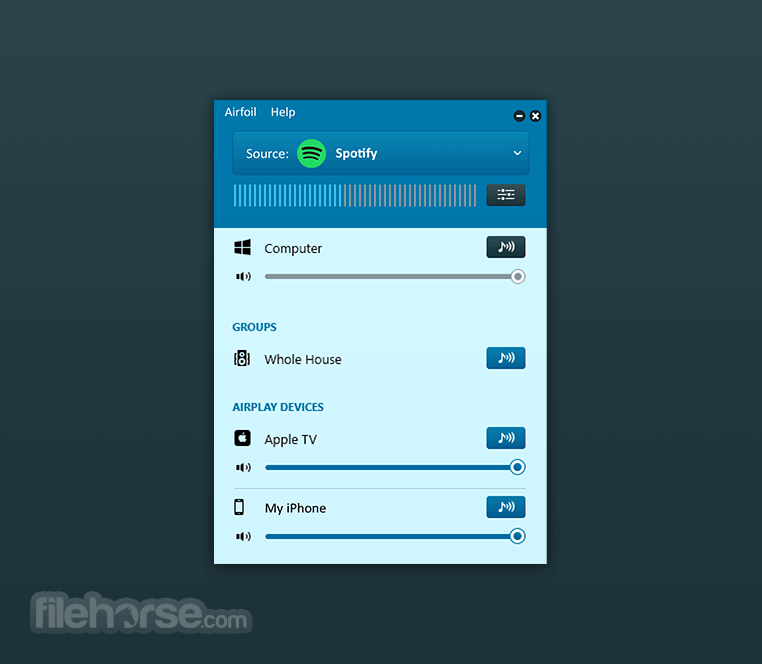 Use Airfoil to stream any audio playing on your PC, from music services like Spotify and Pandora, web-based audio from Safari or Chrome, or anything else you like. Stream the music you love to speakers all over the house: AirPlay, Bluetooth, and more! Everything will play in perfect sync, even between different speaker types. Stream audio from your Mac to Apple TV, AirPort Express, or third party AirPlay devices. Stream audio to any Cast device, including Google Chromecasts, as well as third-party devices like Cast-enabled TVs and speakers. Stream audio to thousands of different Bluetooth audio speakers and headphones. 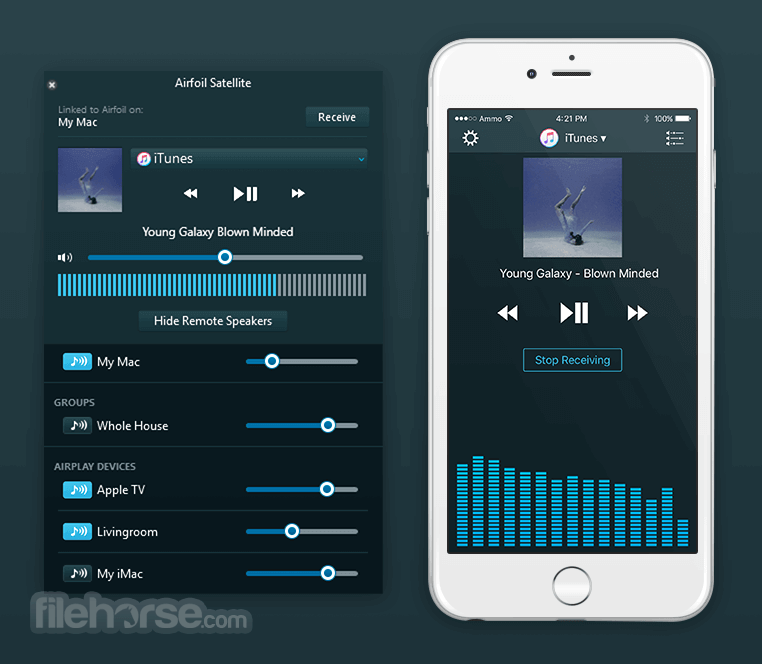 Stream audio to iOS or Android devices, as well as Mac, Windows, and Linux computers. Whether you play to a single device or a dozen different speakers at once, it will all be in perfect sync. Use the free Airfoil Satellite on iOS, Mac, and Windows to remotely control Airfoil and your audio streaming. Note: Noise is overlaid on all transmissions longer than 10 minutes.